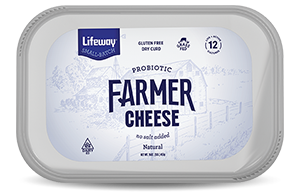 Known around the Lifeway Kitchen as “Samantha’s Square Dance Salad,” this recipe features perfectly caramelized onions, creamy Farmer Cheese, tart cherries and roasted pine nuts. It’s an absolute show-stopper your guests with love time and again. Heat a dry skillet over medium heat and add the pine nuts. Roast, stirring constantly so they do not burn, until lightly browned and fragrant. Remove from heat and divide in two, reserving one half to sprinkle over salad before serving. Crush the remaining half of the roasted pine nuts and add to a medium mixing bowl with the Farmer Cheese. Sprinkle with a generous pinch of salt and pepper and stir until well combined. Using a melon baller to scoop, shape the Farmer Cheese and pine nut mixture into 12-15 small balls. Store the balls in the refrigerator until ready to serve. Return the skillet to the stove and turn the heat on medium. Add a drizzle of olive oil and the onion slices and stir to coat. Cover and allow to cook, stirring occasionally, until golden and soft. Turn up the heat on the stove to medium high and continue to cook the onions for another ten minutes. Season with salt and pepper. To serve, place a generous handful of spring greens onto each plate, followed by some onions, roasted pine nuts, a sprinkle of dried cherries and Farmer Cheese balls. Drizzle with balsamic vinaigrette and season with salt and pepper, if desired. If you can't find pine nuts, walnuts work well, too.